Guest Author and Gear Geek Khoi Chau here to talk about the nuances of locking carabiners. Belay carabiners aside, what are some of the most common applications you use locking biners for? Odds are they are for building top rope anchors and/or for your personal tethers (like the Metolius PAS, Sterling Chain Reactor, a simple sling, or a purcell prusik, etc) or when you use your rope to clove hitch into an anchor. In these cases you will most likely be clipping your lockers into metal hardware already installed into the rock, often in the form of hangers or chains. For these applications I highly recommend that an overall very slim locker be used: It is most important that the locker be slim from the tip of the nose all the way to a bit past the rope basket, as those are the parts of the locker that will be passing through the metal hardware. Ideally, the locker should also be slim in width, when looking at it straight on with the gate directly facing you (spine is farthest away from you in this orientation). These slim lockers tend to be offset-D in shape. The reason for slim lockers is that sometimes you’ll be clipping your locking biner(s) into chain links that are small, or, you be clipping them into hangers that, small or not, already have other biners, or rap rings, or chain links, or maillons in them, so real estate is limited, and you want to maximize it. Worth Noting: In this post you will see images of carabiners in bolted hangers when there are rap rings available. Best practice is to clip the rap ring (not the hanger) as they’re wide, will fit any size carabiner(s), and allows the carabiner(s) to orient in the most ideal direction. This is particularly important on overhanging routes where the hangers may be impossible to clip with even the smallest carabiner. 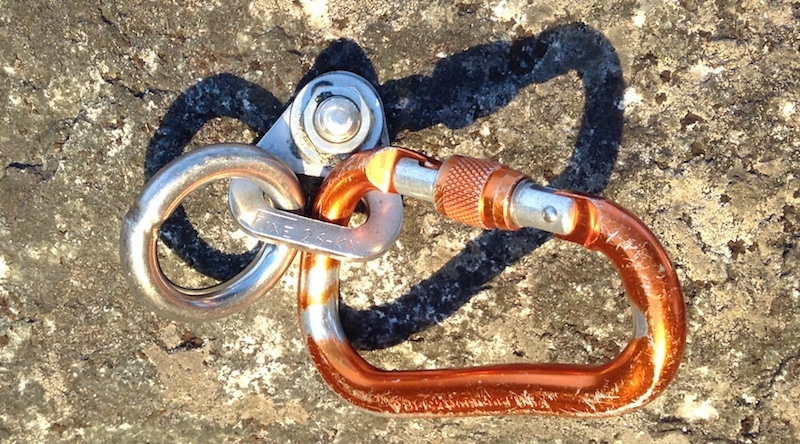 The photos below could be misleading in terms of best practice for clipping into anchors since they do not clip the rap ring; they are used as examples of how carabiners do / do not fit in small areas. We’ll update this post with new photos when we’re able to show carabiners fitting / not fitting in hangors when there is not a rap ring option available. This Climbing Technology Aerial Pro SG fits in hangers and chains and has room to spare. 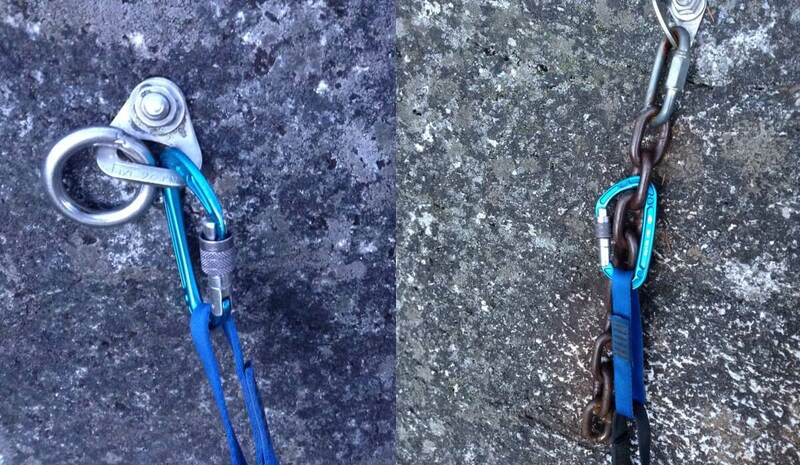 On the left you can see the carabiner can fit perpendicular to the anchor as it can turn freely based on it’s narrow body. On the right you can see it easily fits in small chains. In an ideal world you would clip the rap ring but if you only had the hanger available, this carabiner still excels, as you can see the carabiner is hanging from the spine, and is not torqued in an odd direction. This DMM Phantom Screwgate fits in hangers and chains with room to to turn in any direction in the hanger. This is a “best case” situation because the Phantom fits perpendicular to the anchor and also easily fits in narrow chains. Both the DMM Phantom Screwgate and the Climbing Technology Aerial Pro SG can fit in a hanger along with other hardware in the hanger. Most locking carabiners will not be able to fit side by side in an anchor with something else in the hanger (chains, etc). The C.A.M.P. Photon will fit in most situations (yay! ), but the spine is a little too thick to lay perpendicular to the hanger — this means two carabiners will not fit along with the rap ring. It will not fit in the smallest of chain rings, but it does fit in most. Note: In the hanger, this carabiner can be torqued in a way that is not ideal for the load. If the carabiner was clipped in the rap ring, this would not be an issue. When trying to use a locking biner that isn’t slim, for example a fat, round stock HMS or a D shape locker, you may find that they do fit adequately where you want them to go – most of the time… But, every once in a while, you will find that they are hard to get in and/or out of the hanger or chain link due to their girth, or worse, that they don’t fit AT ALL! Or, that they really limit your options since they take up so much hanger real-estate. 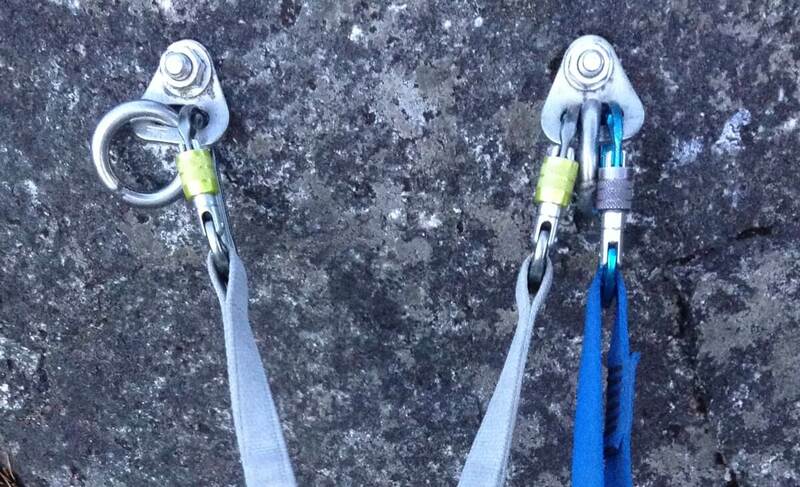 Black Diamond Rocklock, a round stock HMS carabiner, that is best used for belaying, cannot rotate in the hanger (even if the rap ring wasn’t there). If this was your anchor carabiner, and you were on a route with a rap ring you would be in luck, as you could clip the rap ring. If there were only chains available, or a bare hanger, you would be out of luck in most cases. The Omega Pacific Jake Screw carabiner, another round stock HMS carabiner, also best used for belaying, does not even fit in a hanger. There are no common chainrings sizes that this locker will fit into. This carabiner would fit in the rap ring, but not all anchors have rap rings. If there is just a straight hanger, or chains, this carabiner will not be usable as an anchoring carabiner. Beefy carabiners are not what you want to be dealing with when you’re aiming for a speedy transition at the belay, or when you’re on ropegun duty and all your friends are counting on you to put in that top rope anchor, or when you have to bail fast and there are several rappels between you and the ground. Not to mention when you’re on a multi-pitch climb and you have to share the belay station with another party. So why not maximize your odds of things going smoothly and minimize the potential for unwanted stress? Use a slim locking biner for your anchor carabiners; they will easily fit in any situation and give you the most options for success. Below you’ll find carabiner examples that I’ve been testing for years. To make this list I took the nicest option from a wide variety of brands that I have had experience with. And, all the examples below will definitely fit a clove hitch with a 9.8mm rope. Interestingly, you’ll note that most of the carabiners below are the locking version of a carabiner shape that is also sold as a wire/solid/bent gate carabiner. This is because, for bolted anchors, the best carabiner body type is optimized for the smallest but most usable shape. Fits in virtually all anchor hardware (hangers, chains, mallions, etc) easily and with room to spare. In many cases 2 carabiners will even fit in a narrow hanger when there are no other clipping options. Edelrid Pure Slider ($18, 42g) The Pure Slider is actually a super thin auto-locker. If you want to save money, Edelrid also has a screwgate version ($11). Fits in most anchor hardware easily, but not much room to spare; it is unlikely the carabiner will fit in a hanger if there is something else in the hanger. Not guaranteed to fit in all chain sizes. Fits in most hangers (and all rap rings! ), but may require a bit of effort or it might not fit if there is already other equipment in the hanger (another carabiner, chain links, mallion, etc) and is not guaranteed to fit in all chain sizes. Khoi's loves to climb sport and trad, ideally multipitch. His love of rock climbing has driven him to seek out as many different climbing destinations as his vacation days can allow for, and, for better or worse, it has also resulted him amassing an extremely large collection of gear.